The Unique Identification Authority of India (UIDAI), has announced e-Aadhaar Card Signature Validation produce for online downloaded Aadhaar Card letter signature valid through Adobe Reader for Validation of validity Unknown signature. After successfully Downloading of e-aadhaar card online everyone can see Validity Unknown on the pdf, now you can update your e-Aadhaar letter signature valid from the following simple produce. After Successfully downloading of e-Aadhaar Letter everyone can see Signature Validity Unknown and this is also valid for all government services and there is no issue the UIDAI has providing the steps to validate signature just follow. Right-click on the ‘validity unknown‘ icon and click on ‘Validate Signature’. Verify that there is a certification path named ‘NIC sub-CA for NIC 2011, National Informatics Center’. This identifies ‘NIC sub-CA for NIC 2011, National Informatics Center’ as the owner of the digital certificate that has been used when signing the document. Mark the certification path named ‘NIC sub-CA for NIC 2011, National Informatics Center’, click the ‘Trust’ tab and then ‘Add to Trusted Identities’ Answer ‘OK’ to any security question that follows. Check (✓) the field for ‘Use this certificate as a trusted root’ and click ‘OK’ twice to close this and the next window. Note: – Once ‘NIC sub-CA for NIC 2011, National Informatics Center’ has been as a Trusted Identity, any subsequent documents with digital signatures from CCA will be validated automatically when opened. Now your e-Aadhaar Card Digital Signature is Validated, take a copy of printout and use for all services authorized by UIDAI. I have Successfully Downloaded my aadhaar letter as e-aadhaar pdf and taken printout and use it, is it valid document or no? 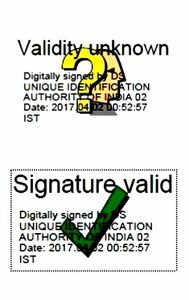 There is no issue to use without using Validate Signature and your aadhaar number is valid to use and there is no mandated to Validate digital Signature of aadhaar, but need to Validate Signature is authorized signature for the digital document that’s the way e-aadhaar letter also has digital Signature and validate it from your self. I have downloaded my Aadhaar Card through mAadhaar App, its also need validate signature? No, there is no need to validate signature for mAadhaar App downloaded Aadhaar Cards, because of mAadhaar also a digital document showing through Mobile phone and it have QR code to check the details. Need to locate Aadhaar Enrollment Centers to Validate Signacher? No, there is no need to locate Aahaar Center to validate digital Signacher, the pdf document will be validate through Adobe Reader Application. I have Submitted my Aadhaar to Correction of Name Change and I need to check Status, After updated of Aadhaar I need to Validate? If you have seen your aadhaar pdf, Validity Unknown you need to validate digital signacher. Hello, I have downloaded eAadhar card and was following procedures to validate the signature. The certification path is not NIC sub-CA for NIC 2011, National Informatics Center’, it is DS Unique Identification Authority of India and issued by (n) code solutions CA 2014, Gujarat Narmada valley fertilizers and Chemicals.should I trust these sources?? My validation is not showing as ‘NIC sub-CA for NIC 2011’ but it is code solutions 2014 . what should I do ? Hello what to do if its showing signature not verified??? Hello, I have downloaded eAadhar card of my kids and was following procedures to validate the signature. The certification path is not NIC sub-CA for NIC 2011, National Informatics Center’, it is DS Unique Identification Authority of India and issued by (n) code solutions CA 2014, Gujarat Narmada valley fertilizers and Chemicals.should I trust these sources?? Hello, I have downloaded eAadhar card and was following procedures to validate the signature. The certification path is not NIC sub-CA for NIC 2011, National Informatics Center’, it is DS Unique Identification Authority of India and issued by (n) code solutions CA 2014, Gujarat Narmada valley fertilizers and Chemicals. Should I trust this source ? I am unable to validate it , Please help. Please continue to follow the steps mentioned, but with the available certificate. One you add them to the Trusted Certificates, the signature gets validated. I tried it with the same certificate issues by CA 2014, Gujarat Narmada valley fertilizers and Chemicals and it worked. Thanks, It is easy method to verify adhar card by digital certificate. Its easy to do it download your adhar. Right click on Signature Valid go to Show Signature Certificate. Go to Trust tab click on Add to Trusted Certificate. Click on the second option check all the check box and click ok.